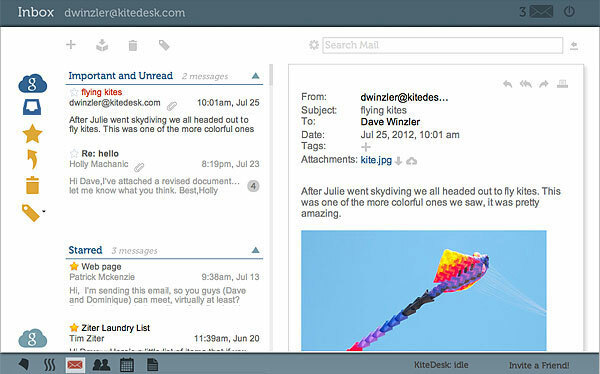 KiteDesk, which got its start as an Outlook-like add-on for enterprise users of Google Apps, received a major, more consumer-friendly redesign ahead of this week’s official launch. Now, the company is more focused on the broader vision of integrating multiple cloud services under one umbrella, and making the data they contain actionable. 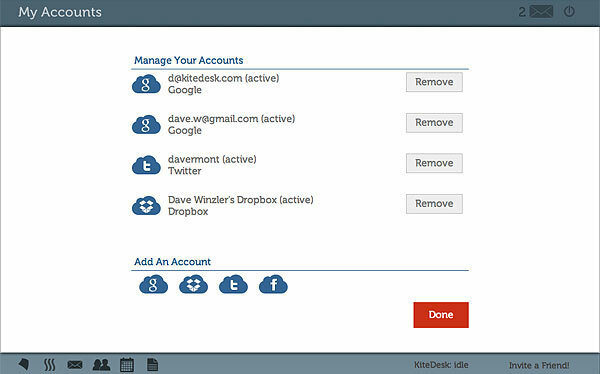 The platform lets you connect email messages, contacts, calendar events as well as documents from Dropbox, Facebook, Twitter, LinkedIn, and Google Apps into your KiteDesk account, so you can search across all these services at once, drag-and-drop files from one folder to the next, as well as organize content into personalized “streams” of content sourced from multiple services. The idea to centralize cloud services is not a new one, to be clear. And it’s been a tough road for startups to follow so far. Notably, early player Jolicloud pivoted this spring in attempt to figure out what’s really going to work in terms cross-cloud search and discovery. (Hint: it’s not a cloud OS.) In June, Greplin, which had been working to deliver an incredibly useful cloud search engine, turned itself into “Cue,” an app with a muddier viewpoint about how to organize cloud-based data. I’ve also been long terrified that my favorite iOS utility CloudMagic, which I launch daily, will soon give up, too. But KiteDesk co-founder and CEO Jack Kennedy says that he thinks companies that have attempted to compete in this space have been too narrowly focused to achieve the goals that are emerging for this class of software. “We see Personalized Information as a ‘Macro Trend’ that’s buttressed by other trends like BYOD, consumerization of I.T., and a gradually diminishing line between personal and professional systems,” he explains. While other startups had focused more on aggregation, search and/or sharing (see also: Dispatch and Primadesk, e.g. ), KiteDesk lets you move files between services – like moving a Google Doc to Dropbox, for example – and it can also prompt you to convert files into supported filetypes along the way. In addition, the service supports something called “Streams,” which are customized windows into your own data, automatically created on the fly, for any given person, day, or address. And you can create your own streams based on domain name, user name, tag, search term or more. For example, users could build a stream for an important customer showing all their files in Docs and Dropbox, contact info, emails, and appointments. Another stream could focus on a particular project. Handy stuff. That being said, one concern about KiteDesk is the design. This is one of those “your mileage may vary” kind of things. The homescreen looks like Windows 8, but the rest of the experience feels more Mac-like – there’s even a touch of Sparrow in some of the icons. That leads to a disjointed feel for what could otherwise be a useful tool. People won’t care about the usefulness of the tech backend, if they don’t connect with the front-end experience. 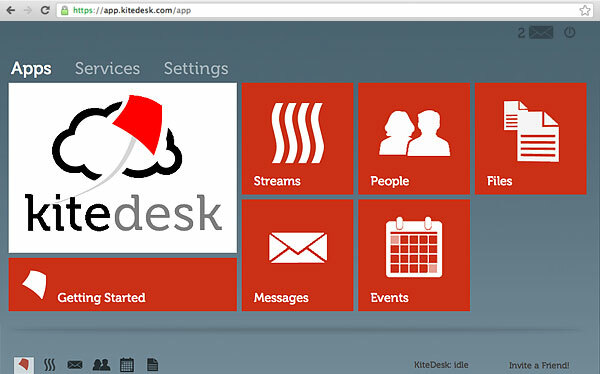 KiteDesk was founded in December 2011 by Kennedy and Jared Rodriguez, who have been working together for over 15 years (KiteDesk is their third company). They previously built an e-commerce company Tradex which sold to Ariba in ’99, then later founded Skyway Software, which focused on enterprise software modeling and code generation. The company homepage is taking sign-ups now, and will send out invites shortly. Facebook and LinkedIn support are not available just yet, but are nearly ready, while support for Exchange, Box.net, Yahoo, Salesforce, and FullContact are on the horizon. Eventually, the goal is to launch a freemium, SaaS subscription model, with premium tiers focused on the business-grade service like Salesforce integration, which would make KiteDesk into something of a CRM system front-end.